The plaintiff herein alleges ownership by adverse possession of a twelve foot right of way (passageway) also known as Washington Terrace extending from between 7 and 15 Washington Avenue, Winthrop, Suffolk County to the beach and flats owned now or formerly by the Boston, Revere Beach and Lynn R.R. Company and to an additional strip of land (asphalt area) located adjacent to and westerly of the passageway on land of the defendants. The defendants have counterclaimed requesting that an injunction issue to prevent the plaintiff, her agents, servants and tenants from obstructing the defendants' right of way over said passageway and from use of the asphalt area. 1. 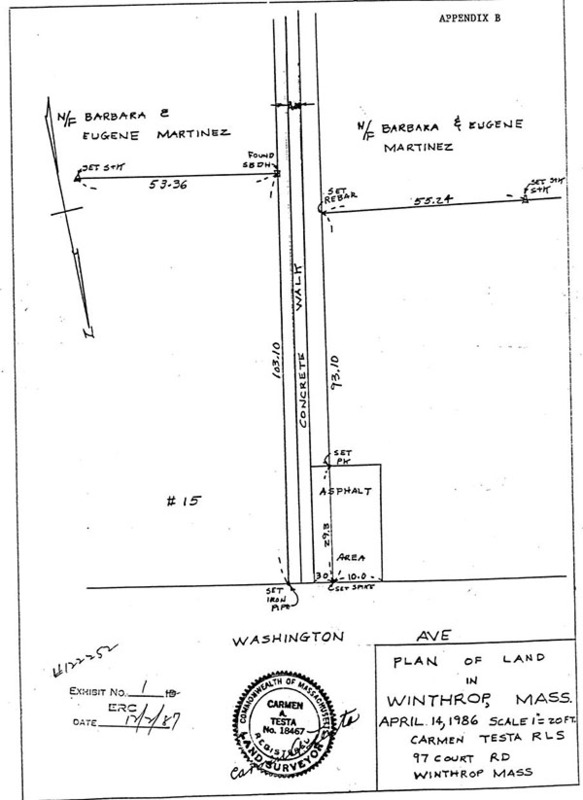 The plaintiff is the owner and resident of property at 1 Washington Terrace, Winthrop, as described in a deed dated September 25, 1952 (Exhibit 2) and shown as Lot A on a "Plan of Land drawn by Whitman and Howard C.E. 's," dated May 8, 1909, (Appendix A) recorded with Suffolk Registry of Deeds in Book 3363, Page 136. [Note 1] The property is bounded easterly "by a Right of Way 12 feet in width . . . together with a right of way over the landmarked "Right of Way" on said plan, to be used for all purposes for which streets and rights of way are commonly used." 2. 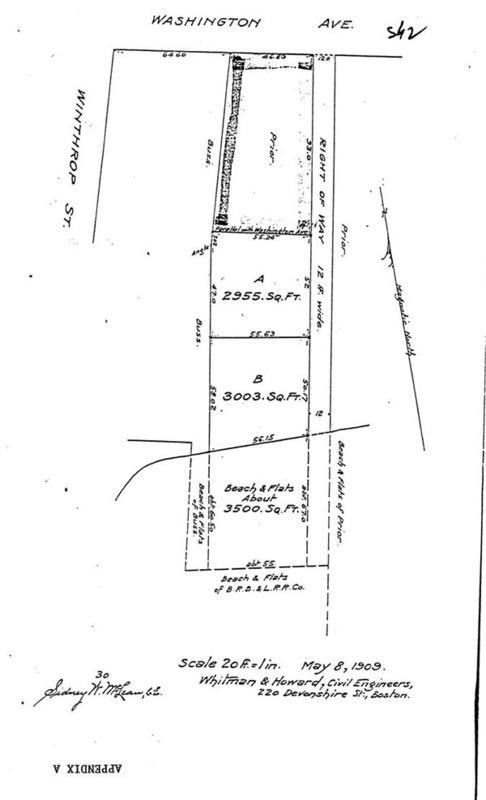 The defendants are the owners and residents of property at 7 Washington Avenue, Winthrop, as described in a deed dated August 29, 1985 (Exhibit 12) and shown as land of Prior on said 1909 plan described above. This property is bounded easterly "by a passageway as shown on said plan to be twelve feet in width and ninety-three (93) feet in length. Together with the right to use said passageway in common with others legally entitled thereto for all purposes for which private ways are usually used in this Commonwealth, throughout its entire length from said Washington Ave., to the flats of the Boston, Revere Beach and Lynn R.R. Co."
3. The locus consists of the twelve foot wide passageway which is paved over only about six feet in width, and also an additional strip of land located on the westerly line of the right of way along the easterly side of the defendants' property extending 12" westerly from the set spike fronting Washington Avenue and extending westerly 27' from a set spike at the end of the asphalt area for a distance of 29' 3" along said asphalt area all as shown on Exhibit 1 (Appendix B). 4. The plaintiff and her family used the passageway for parking, usually parking to the right of the sidewalk (entering from Washington Street) as the pathway was used regularly for foot traffic. The plaintiff testified that her family has been parking on the passageway in excess of twenty years. 5. The Budreau family was the defendants' predecessor in title to the property at 7 Washington Avenue from 1954 to 1984. While the plaintiff may have paid for paving the right of way, the Budreaus paid to have the asphalt driveway placed on their property in 1957 (Exhibit 9). A friendly relationship existed between the Budreaus and the plaintiff's family, and the passageway was often used by the Budreaus to visit the plaintiff's home. The present controversy arises over the issue of parking cars. The plaintiff claims that she has acquired title to the fee in the entire passageway by adverse possession such as to extinguish the express right of way granted by deed to the defendants. The plaintiff relies on the parking of motor vehicles for over twenty years on the passageway, yet by her own testimony admits that she never posted the area, enclosed it or ordered any person off it. In addition, the plaintiff agrees that the lawn on the property at 15 Washington Avenue which bounds the passageway on the westerly side encroaches on the passageway by five feet. "Title by adverse possession can be acquired only by proof of nonpermissive use which is actual, open, notorious, exclusive and adverse for twenty years." Ryan v. Stavros, 348 Mass. 251 , 262 (1964). Such requirements put the owner on notice as to the hostile activity of possession and allow him an opportunity to vindicate his rights by legal action. Boston Seaman's Friend Society v. Rifkin Management, 19 Mass. App. Ct. 248 , 251 (1985). With respect to the adverse possession claim by the plaintiff, I find and rule that the plaintiff's use of the defendants' property was permissive and therefore does not establish the plaintiff's title to the passageway and the strip of asphalt on the defendants' property. I further note that as the plaintiff and the defendants are co-tenants of the passageway, the burden of proof necessary to establish title by adverse possession is even greater as sole possession by one co-tenant is not necessarily a disseisin of the other inasmuch, as each co-tenant is entitled to possession of the entire passageway. See Allen v. Batchelder, 17 Mass. App. Ct. 453 , 455-456 (1984). With respect to the counterclaim filed by the defendants, I rule that neither party shall park vehicles on the passageway such as to obstruct the rights of others lawfully entitled thereto to pass and repass over said passageway and that the plaintiff shall not park vehicles on the asphalt area on the property of the defendants. Based on the various deeds, I conclude that the plaintiff and the defendants both have the right to use the passageway shown on Appendix A attached hereto for all purposes for which private ways are usually used in this Commonwealth. Both parties have requested proposed findings of fact and rulings of law and I have declined to rule on these as I have made my own findings on the questions of fact I deem material and on the law I believe applicable.